Somerville residents are asking for new traffic calming measures after a fatal pedestrian crash last weekend on Powder House Boulevard and Hardan Road. Police are searching for the driver, who fled the scene. The Somerville community is wrestling with the horrific crash that killed a teacher in a crosswalk last Friday night. Somerville Police are still searching for the driver in the Somerville pedestrian crash. The driver struck Allison Donovan, an educator in the Watertown public school system, shortly after 7 p.m. Friday, then fled the scene. Another woman in the crosswalk suffered non-life-threatening injuries. As police investigate, city officials say a community meeting will be held to discuss accelerating traffic calming measures for the area. The pedestrian accident happened on Powder House Boulevard, at the intersection of Hardan Road, near the West Somerville Neighborhood School. In response to the crash, the city began setting up flex posts with neon reflectors Monday. For the short term, Somerville Police will be there to assist students who are dropped off and picked up at the West Somerville Neighborhood School. Message boards are also being deployed in the area along with the flexposts. But residents are now calling for more, including speed bumps to force drivers to slow down. Communities can implement traffic calming measures to change driver behavior and improve safety conditions for non-motorized street users. Speed bumps and raised intersections are two examples of traffic calming measures. Other examples may include protected bike lanes and cycletracks which allow cyclists to travel inside curbing and away from cars, trucks and rideshare vehicles. Different areas may require different traffic calming measures. Some communities may address a single intersection or street. But often, communities are working on larger areas. Slower speed limits are another traffic calming measure. Boston, Cambridge and Somerville were among the first communities to reduce speeds to 25 mph a few years ago, when the state gave communities this authority. In Somerville, city officials have already implemented many traffic calming measures, including on Powder House Boulevard, which has received physical and painted sidewalk bumpouts, improved crosswalk markings and flashing stop and crosswalk signs and vertical reflective crosswalk markers. In the City of Somerville’s online update, it also noted there is a flashing pedestrian activated crosswalk sign at the intersection near Hardan St. This is where the pedestrian crash happened. But this spring, Somerville city officials had planned additional traffic calming measures on Powder House Boulevard, between Curtis Avenue and North Street (the fatal pedestrian accident happened in this area). Speed bumps and traffic tables were already on the schedule to be considered after the completion of bike lanes and sidewalk bumpouts. 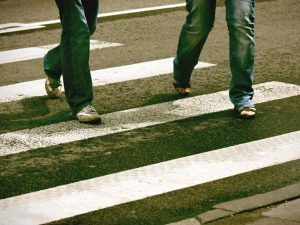 Now, city officials say they are seeking options to bring in speed bumps and traffic tables sooner. The Boston personal injury lawyers at Breakstone, White & Gluck specialize in representing those injured by pedestrian accidents and other car accidents. Over the past three decades, our attorneys have helped pedestrians and their loved ones understand their legal rights and obtain the full compensation they need for their injuries. When a loved one is lost, a surviving spouse or the decedent’s children may be able to pursue a wrongful death claim against those who were negligent. Our attorneys are experienced in representing families in wrongful death claims in Massachusetts. For a free legal consultation, call Breakstone, White & Gluck: 800-379-1244, 617-723-7676 or use our contact form.